When Phyllis Forsey left for New York City in 1957, she was not headed for The Art Students League like some of her Utah peers. She took a more circuitous route to a painting career. 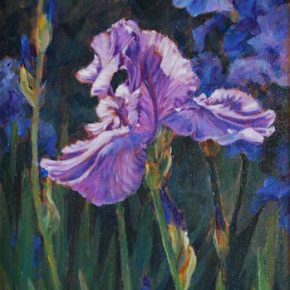 Forsey had just finished her freshman year at BYU, where she had taken several art classes and “painted the flora and fauna and the figure,” but also realized how much she liked to sew. In a pattern book, she discovered an opportunity to study fashion design back East for a year. (“You’d never know it to look at me now,” she says with a rueful smile. “I like to be comfortable.”) After talking things over at home in Richfield with her mother, where her father had the Forsey’s Ice Cream plant – and Phyllis would pitch in summers making popsicles – she determined to leave. A gutsy move for an LDS girl from a small town in an unknown state, and she indeed felt like a duck out of water for a while around the sophisticated group at the Fashion Academy in NYC. That was until she located a “great” ward and, within the week, had an apartment with two roommates. They split the $140 a month rent. 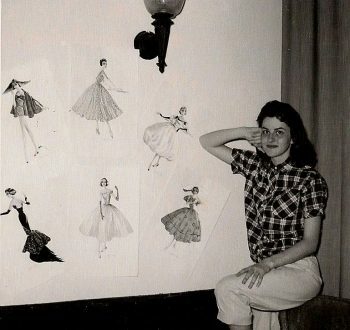 She met her husband-to-be, a medical student, at that same great ward and, after finishing her fashion illustration training, Forsey went down to the Garment District and landed a job drawing fur coats. “Then [the owner] found out I could sew, too,” she recalls. That was around 1956. She got married in Salt Lake City in 1958 – then returned to New York. In all she spent seven years there. She had to stop working for the furrier when Karen came along – the only artist out of Phyllis Horne’s six children. 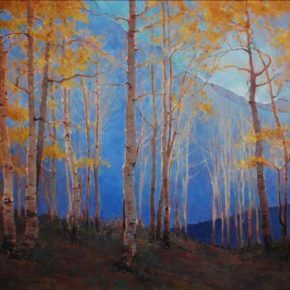 Karen eventually would open Horne Fine Art in Salt Lake City with husband Michael Rowley, and represent her mother along with other fine artists. The gallery is celebrating its 15th anniversary tonight, Feb. 16, during Gallery Stroll. In New York with her fashion illustrations. Phyllis Forsey Horne certainly plans to be there. 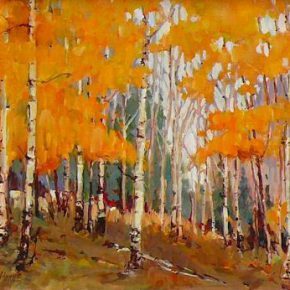 She overcame a lot of obstacles to become an artist and her paintings of trees and gardens and rural Utah landscapes now hang in numerous public and private collections including the Utah State Art Collection at the Governor’s Mansion, the Salt Lake County Collection, Kennecott Copper, St. Mark’s Hospital, and the Springville Museum of Art Permanent Collection. 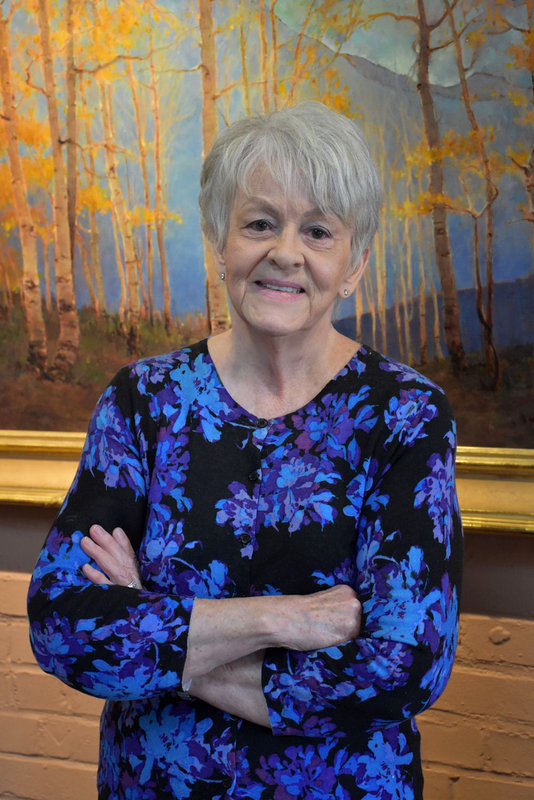 She exhibited for several years at the Utah “Days of 47” Invitational (where 47 artists were invited to show); and was selected as “One of the Hundred Most Honored Artists of Utah” by the Cultural Olympiad Curatorial Committee in 2002. Karen Horne recalls that her mother’s small studio was next to the laundry room – and laundry was going all the time in that large household. Still, Phyllis made time to paint. Her lone experience with acrylic was a sign she painted for her older sister’s beauty shop. Her other sister taught grade school and her brother ran the ice cream plant after her father retired. “He finally sold out – it was hard to compete with Carnation and Meadow Gold. You either had to [modernize] or part with it. So he ended up selling insurance,” says Horne. In 1981 Dave Ericson had Phyllis Horne’s first one-person show. “I’d only shown with a group before that,” she remembers. Her career took off from there. 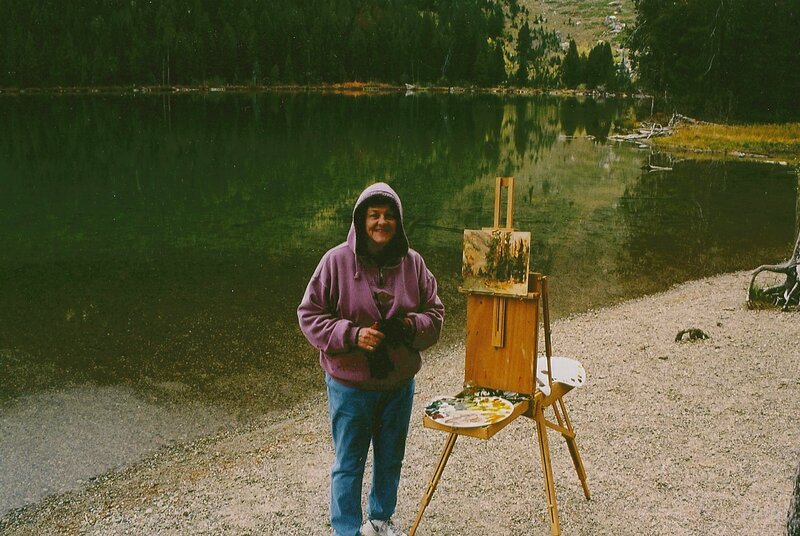 She “sort of” paints from photographs, something she did more often with her Nikon and telephoto lens. She doesn’t do well with digital, she says. “But being a Realist I have to get a start from something. It’s usually my own composition on the photograph, but the paintings take on a life of their own after a while and I get a totally different scene,” says Horne. 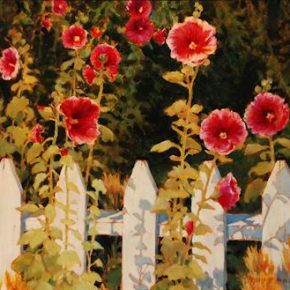 “I get a lot of hollyhocks from my imagination because I’ve painted so many of them,“ she says, laughing. 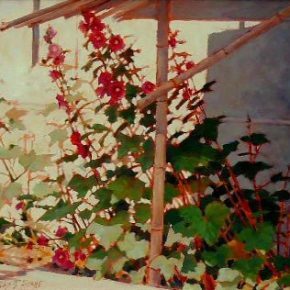 Horne doesn’t go to Watercolor Society anymore. “Because I’ve lost so many friends, some older than me and some younger. We do kind of come and go.” And she doesn’t do Facebook. “I’ve stayed away from all of it. I just don’t want to go around looking down. I’ve got to look up at the clouds. I want to see the skyline. I just have to be looking around,” she says. 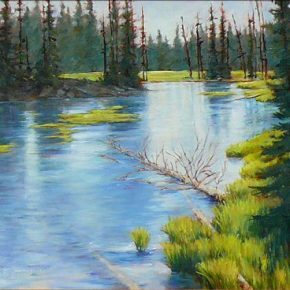 “15th Anniversary Celebration” with Phyllis Horne and other artists, Horne Fine Art, Salt Lake City, Gallery Stroll reception, Friday, Feb. 16, 5-9 p.m.